Hey everyone, I got my Samsung galaxy s3 a few days ago and I made a mistake, I downloaded GO launcher and my phone started working not as good and as smooth as it did at the beginning, so I deleted it and now I feel my phone isn't working as well as it did, so I would like to backup all the info, reset the phone and then restore all the info back. Do you think I should do it (if the answer is yes, please tell me how to do it)? Intend to backup all the contents on your Samsung Galaxy S3 to the PC for fear that you might lose them out of carelessness? Well, it's a good thing to take precautions beforehand. But, doing Galaxy S3 backup and restore is not as easy as pie. You need a third-party tool to help you. 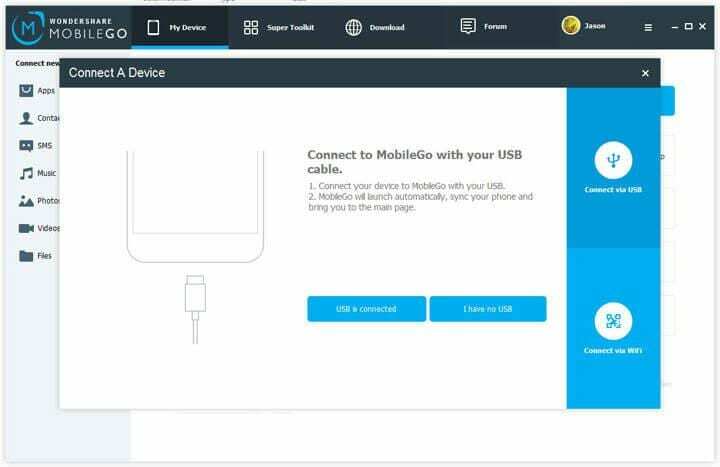 Look here: Wondershare MobileGo for Android (Windows) or Wondershare MobileGo for Android Pro (Mac). This Android manager enables you to backup and restore contacts, apps, call logs, SMS and more on your Samsung Galaxy S3. 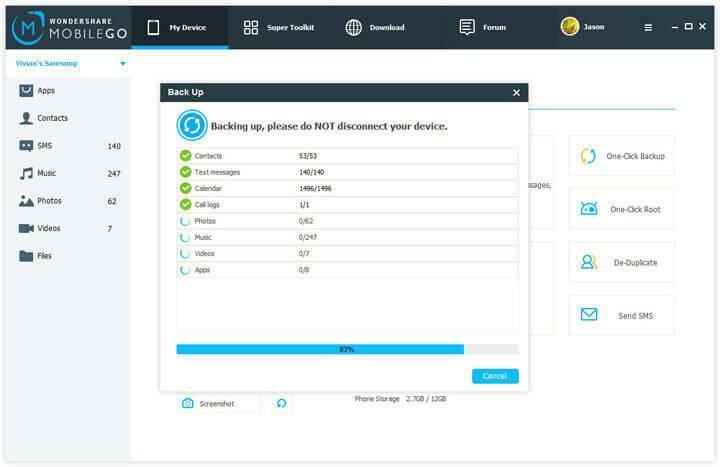 Download the free trial version to backup and restore Samsung S3. Choose the right version according to your situation. In the guide given below, I'd like to focus on the Windows version. Note: The windows version gives you the chance to backup and restore more data on your Samsung Galaxy S3 than the Mac version does. At the very beginning, launch MobileGo for Android to bring up the connection window. Windows users can use a USB cable or WiFi to connect Samsung Galaxy S3 to the computer. As Mac users, you can make the connection via the USB cable. In a few seconds, your Samsung Galaxy S3 will be detected and then displayed on the primary window. 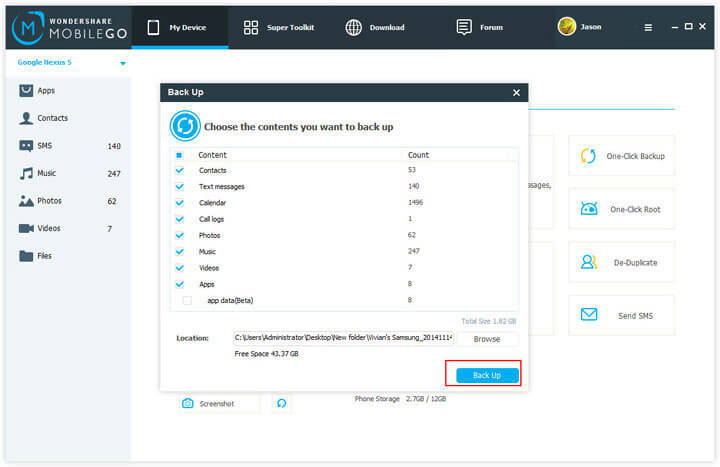 In the primary window, click "One-Click Backup". In the pop-up backup window, all contents are ticked off. They're contacts, text messages, call logs, calendar, playlists info, apps, music, videos and photos. Uncheck your unwanted data when you just decide to backup some of them. By default, the backup file will be saved in D: \Documents\Wondershare\MobileGo\Backup\Nancy's Samsung_20130719180114. You can also choose another save path by clicking "Browse" After that, click "Back up". In the left sidebar, click "Tookit". Then click "Restore" in the tookit window. All the backup files you have done with MobileGo for Android will be shown in the restore window. Choose one and click "Restore". 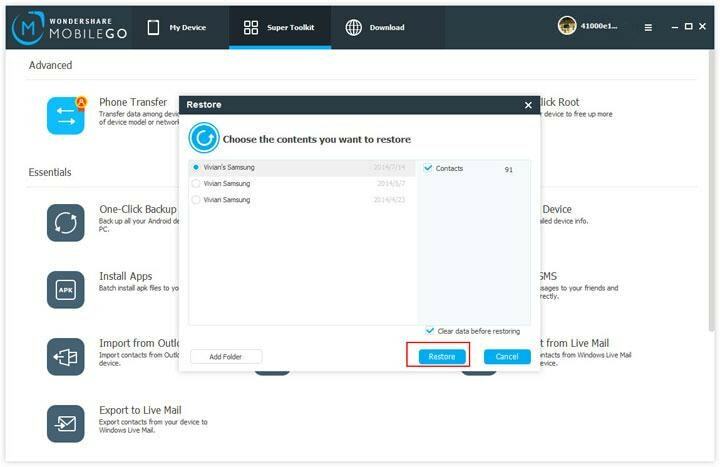 That's all about how to backup and restore Galaxy S3. 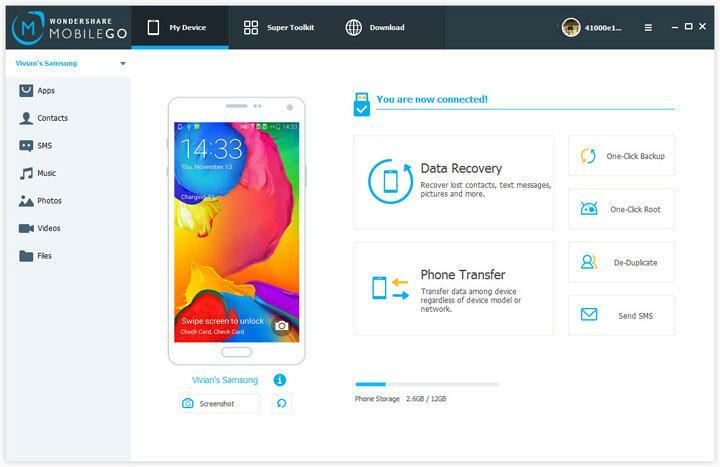 With MobileGo for Android, you never need to worry about losing data on your Samsung Galaxy S3. Transfer contacts, text messages, call logs, calendar, photos, music, video and apps between iPhone, Android, Nokia (Symbian) phones and BlackBerry – in one click! Samsung + Kies + Windows 8 = Failure !! !